Reverso levers and bar-end shifters! 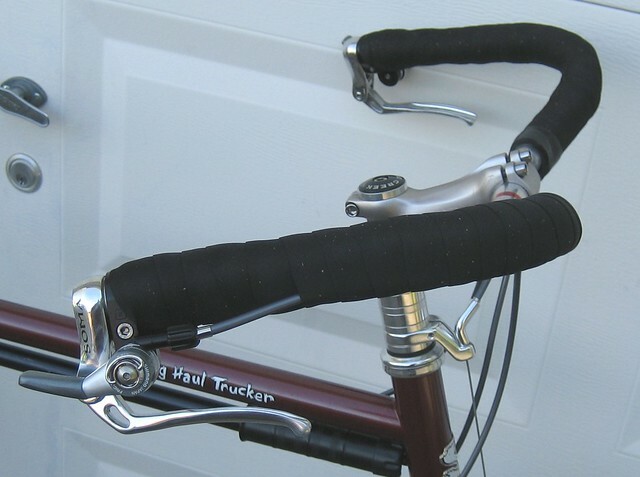 humblecyclist on flickr set his Long Haul Trucker’s Albatross bars up with both reverse brake levers and bar-end shifting… at the same time. Paul Thumbies holding Shimano shifters, coupled with Soma reverso levers on Albatross bars. Super-cool. Humblecyclist says after 4+ years of this setup, the only weird part is the reverse shift direction (down for larger on the rear). My version would be a single front brake on the left, and a single “normal” bar-end shifter on the right. Dangerous, bad, and wrong.